Good grief. This whole wedding organisation is a bit overwhelming. Don’t get me wrong, I’m sooooo happy My handsome Darling asked me to marry him. And we want to share the day with our family and friends who have supported us through our years of singledom. But even though you approach it with fun and enthusiasm to put your personal touches into it – it is A LOT of work. It’s not just another event, it’s a once in a lifetime spectacular. My poor Darling has been at the brunt of quite a few polar opposite “discussions” on decisions. Thank god he is so patient. Now I can certainly see how the term “bridezilla” came about even though I’m sure those brides were some of the nicest girls. Before they became immersed in all the minute details that go into the big day extravaganza. 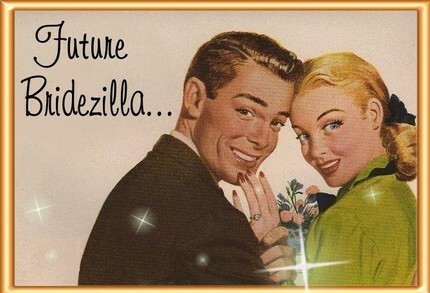 Apparently there was a tv series called Bridezilla. I’m going to have to rent it.